We are happy to announce the launch of usage statistics on Zenodo. From today, you will find the number of views and downloads on record pages, and you can sort search results by most viewed. By default we roll-up usage statistics for all versions of a record. However, it is also possible to see detailed usage statistics for the specific version of a record. We strongly believe in user’s right to privacy, thus we have spend a lot of time to design our system to ensure all tracking is completely anonymized. 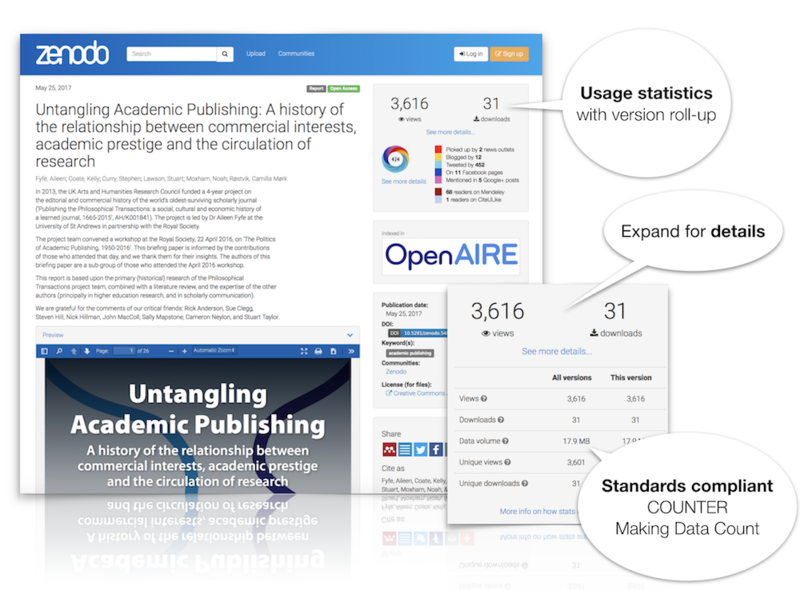 Our usage statistics is further tracked according to industry standards such as the COUNTER Code of Practice as well as the Code of Practice for Research Data Usage Metrics and thus allows you to compare metrics from Zenodo with other compliant repositories. You can read much more about this, and exactly how and what we track in our FAQ. The launch today, also only marks the beginning. We will later also be adding usage statistics e.g for your communities, so stay tuned! If you have any questions or feedback (positive and negative) don’t hesitate to get in touch with us.